In the wake of SiriusXM's $3.5 billion deal to acquire Pandora, Standard Media Index released the most current trending data on its ad revenue growth vs. chief audio streaming competitor Spotify and the radio marketplace overall. 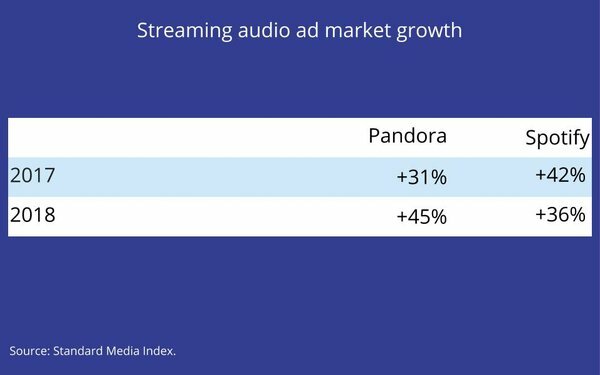 For the first eight months of the year, Pandora had the fastest U.S. ad revenue growth, rising 45% versus the same period in 2017. During the same period, Spotify's U.S. ad revenues expanded 36%. Interestingly, both beat the traditional radio marketplace by a wide margin. According to SMI, traditional radio ad sales fell 1% during the period. Meanwhile, Pandora's new parent, SiriusXM, saw its U.S. ad revenues expand 19%. 2 comments about "Data Shows Pandora Fastest-Growing Audio Market Player: +45%". Nancy Batsell from Hubbard Broadcasting, Inc., September 25, 2018 at 4:17 p.m.
Joe Mandese from MediaPost, September 25, 2018 at 4:26 p.m.
@Nancy Batsell: You are correct, the headline was a mistake and has been corrected. Pandora was fastest growing so far this year. Spotify was fastest growing last year.